Produced by Rom-Com queen Nancy Meyers (The Holiday, Something’s Gotta Give, What Women Want) who also happens to the director’s own mother, the film much like The Holiday, nails its Hollywood credentials to the mast by basing the story in and around the film business, but sadly lacks the authenticity of Meyers senior’s own foray into the genre. Alice Kinney ( Witherspoon) is almost 40 and newly separated from her music manager husband Austen (Michael Sheen). After years of living in New York, Alice has bitten the bullet and moved herself and her two daughters back to her hometown of LA, and into her now deceased film director father’s old Hollywood home. 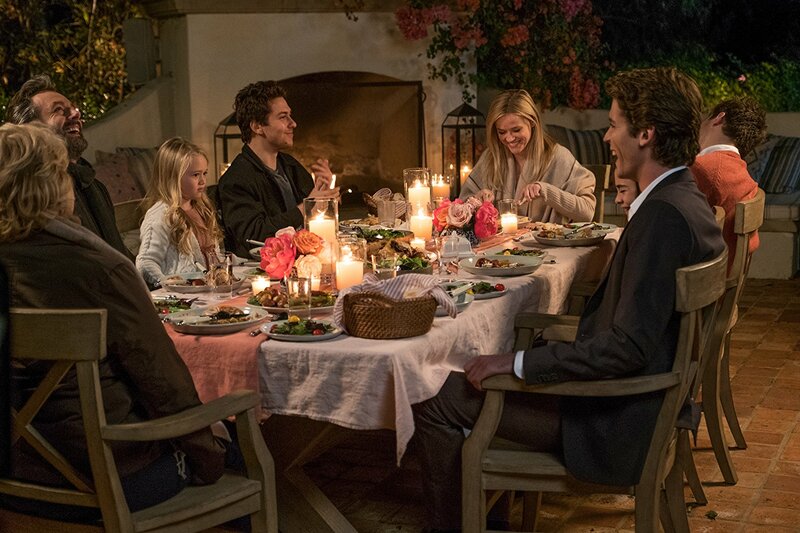 When out celebrating her birthday, Alice encounters Harry (Pico Alexander), Teddy (Nat Wolff) and George (Jon Rudnitsky), three friends who have recently moved to LA in the hope of getting their award winning short film made into a feature. As one thing leads to another, Alice finds herself involved with Harry, a handsome lothario who is almost half her age, and whose advances she finds almost impossible to resist. To complicate things further, the trio who have just been given their marching orders by their long suffering landlord, are invited by Alice’s mother Lillian (Candice Bergen) to stay in Alice’s guest house until they find somewhere else to move into. Hilarity ensues when Alice’s estranged husband turns up out of the blue to throw a spanner in the works. Meyers-Shyer plays with the usual rom-com tropes, but cannot resist an homage to her own mother’s work in The Holiday. With an, at times, almost cringeworthy Morricone-esque score and a rather ludicrous narrative arc, the film does a decent enough job in keeping you hooked to the story and even manages to raise a few laughs, but if you are expecting anything of any substance, then look elsewhere. A charming yet deeply flawed first outing from Hallie Meyers-Shyer, which isn’t as bad as you might think.